Recently I taught a brief, three hour long, Arduino 101 course to some fellow members of the Western North Carolina Linux Users Group (WNCLUG). 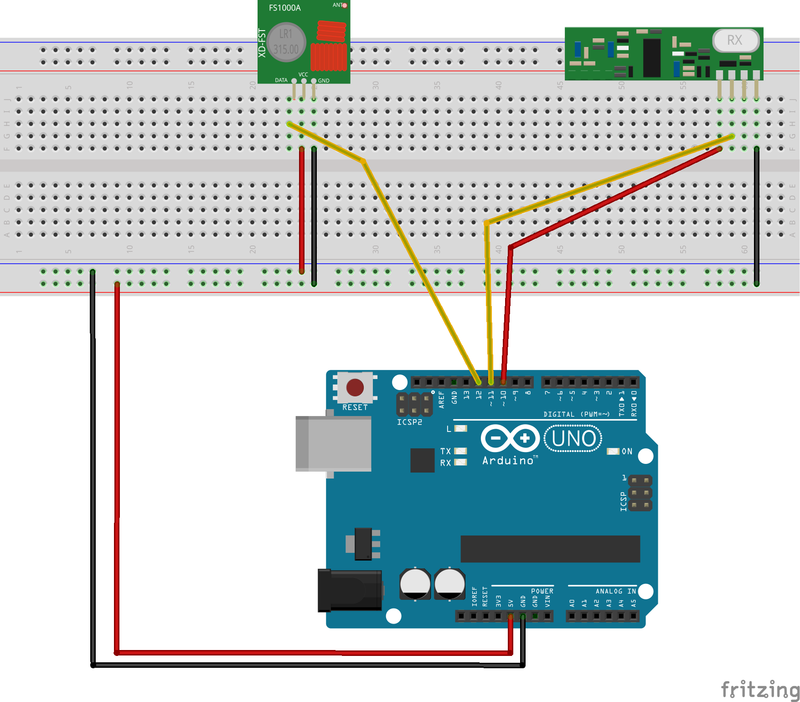 One of the three lessons in the course was for the students to pair off and use inexpensive Chinese 433 megahertz radio modules to send data between an Adruino Uno with a FS1000A transmitter running transmitter code and another Adruino Uno with a MX-RM-5V receiver running receiver code. We talked about applications using a transceiver but these radios were discrete transmitters and receivers, NOT transceivers. 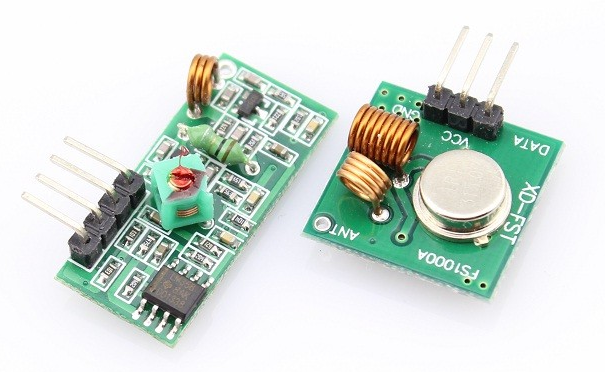 Of course that was understandable because this transmitter and receiver set only cost 88 cents (in bulk), including shipping from China via AliExpress. Recently, I got to thinking – it seemed to me that I could use the two boards (FS1000A & MX-RM-5V) with a single Arduino to create an 88-cent transceiver through software. Consequently, I wrote some code that does just that is explained herein. RadioHead has a useful Push To Talk (PTT) feature that I opted to use to control receiver’s power. The PTT feature is intended to control a genuine transceiver but I use it to toggle on/off the power for the MX-RM-5V receiver. I invert the pin in software such that power is removed from the receiver when the transmitter is keyed. The receiver MX-RM-5v Working current at 5V is a nominal 4ma and the Arduino can source DC Current per I/O Pin at 40.0 mA, so powering the receiver via an Arduino works without issue. 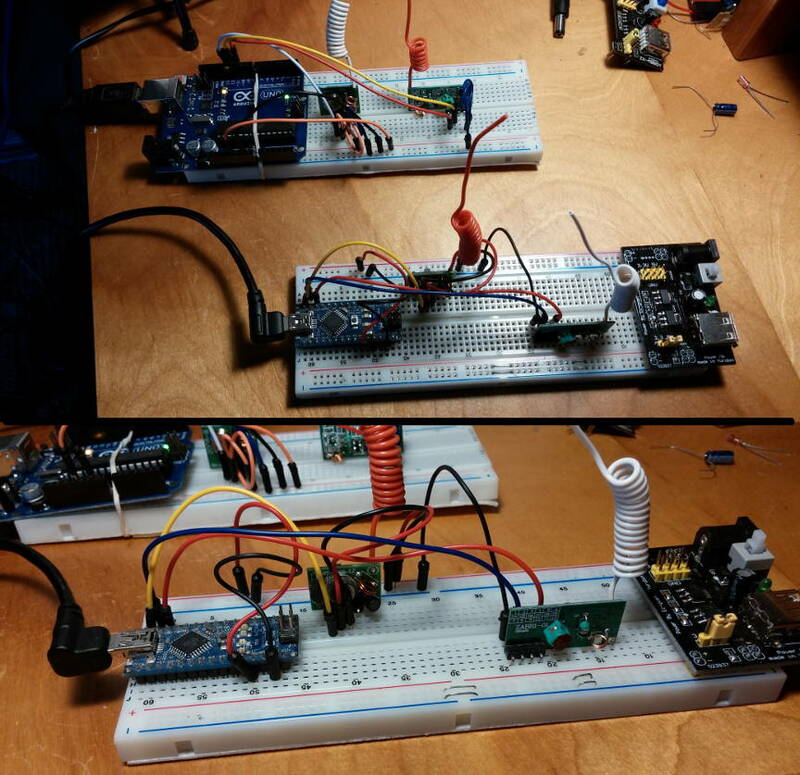 I cobbled together a simple test of the software with two breadboards (see Fig 2). 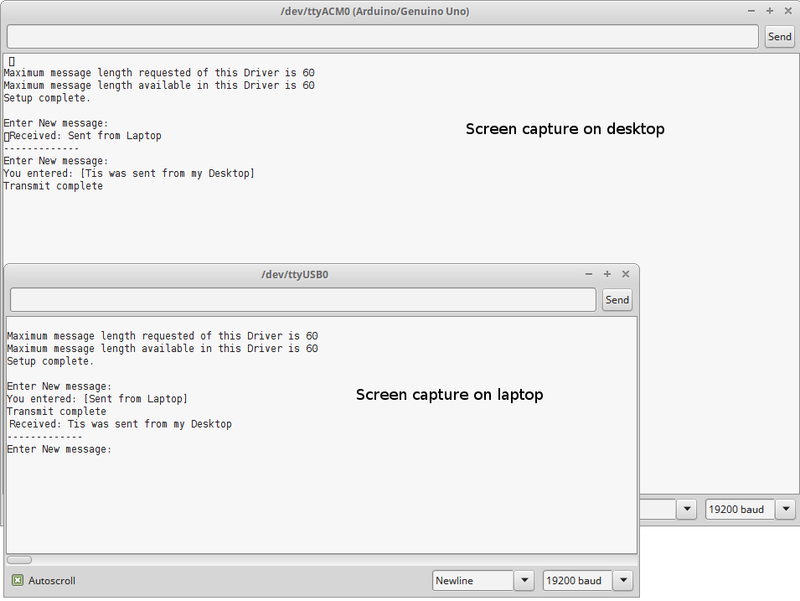 The serial ports were each monitored on my desktop and a laptop. Fig 3, below shows two-way messaging between the two pseudo transceivers. While I have tested these cheap ASK radios at over 50 feet, I have read reports by others that they will work much, much further. These particular radios are test rejects from a bulk order made for my class and they won’t work much further than a foot apart. Someday I may try to tune the suspect receiver. Below, in Fig 4, I show the wiring for my tests – both breadboards are wired identically and run the same code. UPDATE: January 30, 2017 – I tested a different, higher rated radio with the exact setup and code, EXCEPT that I only tested one-way communications – because I was testing the radios, not the code. I tested the STX882 / SRX882 radio pair shown in Figure 5, below, and they worked well. Ok, not these two because I haven’t soldered the antennas onto these yet – it was another pair. I did not test maximum range but they worked across the table – see Figure 6, below. Their manufacturer, NiceRF, claims an effective range of 100 meters. The source code can be downloaded from: http://pastebin.com/kv2wyWjv and is also shown below. NOTE: Source code updated on December 26, 2016.
receiver, i.e., FS1000A and MX-RM-5V, etc. transmitting in order to prevent swamping the receiver. This entry was posted in Arduino, Electronics, Programming, software, wireless and tagged 433mhz, Arduino, radio, RadioHead. Bookmark the permalink.